Independent heating, TV, AC, WiFi, CD and DVD player, microwave, dishwasher, washing machine, kettle, hair dryer, doorman, no elevator. PLEASE NOTE : This apartment is suitable for a family with children ; A Spa center is in the building. Apartment was well situated, clean and cute. Apartment was on first floor, up narrow stairs, without a lift. No where is this mentioned in any advertisement and picture leads you to believe it is on the ground floor- Bad for people with bad legs. Owner unresponsive, had to wait nearly four hours to gain access. Owner acknowledged any problem, but made no effort to resolve them. Only one full set of keys. Owner acknowledged, did not correct. Living room dark, many lights did not work. Owner acknowledged, did not correct. Ceiling fan in main living area was broken. Owner acknowledged, did not correct. Très bel appartement juste à coté de Campo di Fiori. L'accueil dut parfait et notre séjour aussi. Merci pour ce très bon moment. We truly enjoyed staying in Apartment 421 in Rome. We especially liked the location and how we could easily walk through quaint side streets to find delicious food, fun entertainment and great shopping. We stayed here with 3 kids under the age of 10 and it was an excellent size apartment. One recommendation - please replace the towels with newer ones and have some more available. For a family of 5, there were only 4 towels and they were very worn. Thank you again for a wonderful trip to Rome! We are a family of 5 - (grown up boys- age 21, 24 and 28) and stayed in this appartment in Rome for 4 nights. The location is SO good - we didn´t take public transportation once, but were able to walk to all the major sights + the local area is filled with cafe´s, restaurants and the Campo de Fiori market is 5 min away and beautiful Trastevere max 10 min´s away. The appartment itself fulfilled our needs - clean, cozy, colourful and perfect space for all of us, and we had a very friendly welcome by the owner. A tip for transportation from and to the airport. Check following site: www.clickairporttransfer.com . It works perfectly and is cheaper than taking a taxi or train when being 5 persons. The apartment was very nice, great accommodations, and its location in Rome old town allowed us to get to attractions in the area and to public transporatation that we needed. The check-in went very good and we very much enjoyed our stay. We had a wonderful holliday in the apartment. we were 5 girls and it worked so good with only one bathroom. There is a grocerystore just 3 minuts away, here we bought bread every morning. We went sightseeing every day and we could walk to all the places. It was so perfect, and i can highly recommend the apartment. We loved our stay at this apartment. We were two adults and two children (11 and 8). 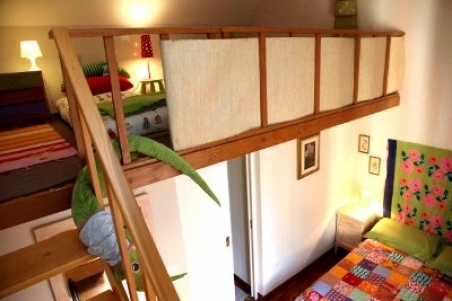 The apartment was clean, located perfectly between campo dei fiori and trastevere. There was an electric bus that stopped very close by (the 116). We were close to the Vatican as well. There was a market right down the street. All of the appliances worked perfectly. Nadia, the owner was wonderful and explained how everything worked before she left and gave us contact information. Our kids loved their little loft and I would say this is a perfect apartment for a family. I would love to visit Rome again and we will check for this apartment first! This apartment had everything we needed for our family vacation! We were staying in this apartment with our 2 children (1 and 9 year old). The best thing about this apartment is LOCATION! You walk 5 min to Trastevere to eat in every good restaurant, it takes few steps and you are on Campo Dei Fiori, where you can go to the market in the mornings, it takes less then 10 min and you are on Piazza Navona and so on. The little electrical bus nr.116 runs from Via Giulia and this takes you almost every important location in the city if you don’t want to walk and it goes till Villa Borghese park where you can go to zoo with children and enjoy the beauty of the park, take the bicycles and drive around or have a picnic. Apartment has everything you need to prepare your breakfast or dinner, corridor door and main gate is closed at the evenings so you can leave baby carriage down stairs. We also found wooden floors to be very homey, as to compare to most of the apartments in Rome they are with cold tile floors so children can't run around barefoot. Living room is full of books and sofa is comfy, children had their own space, as bedroom has two levels – upper level with to beds meant for children is ideal for them to play and rest. And the owner of this apartment is absolutely lovely - very friendly and helpful, made us feel welcome!